Despite our good result on Saturday night, there has again been some disgruntlement at the impact of what is perceived to be bloc voting, but actually amounts to a combination of geographical (or classic “friends and neighbours”) voting and diaspora voting. 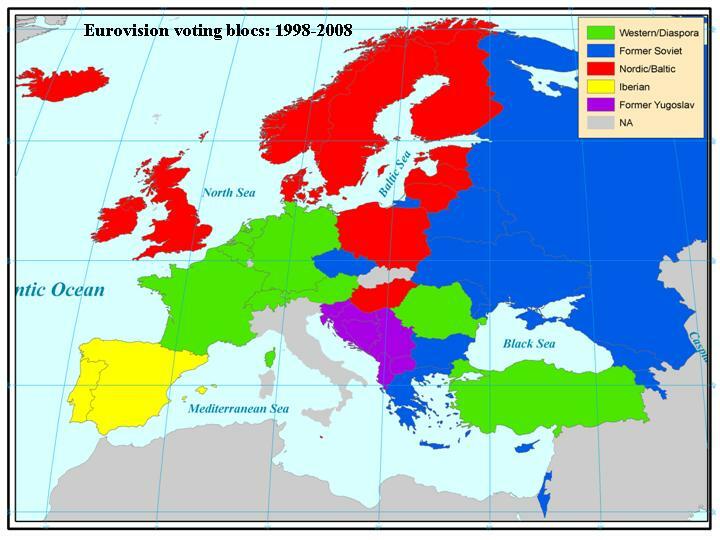 Analysis I did on televoting patterns by different Eurovision countries in past contests suggests the existence of different voting blocs that tend to especially favour certain countries in Eurovision contests and from which other bloc members will expect to poll their greatest number of votes by and large. These different blocs – Western European-Diaspora, Former Soviet-Orthodox, Former Yugoslav, Iberian and Nordic – are described in the above map. 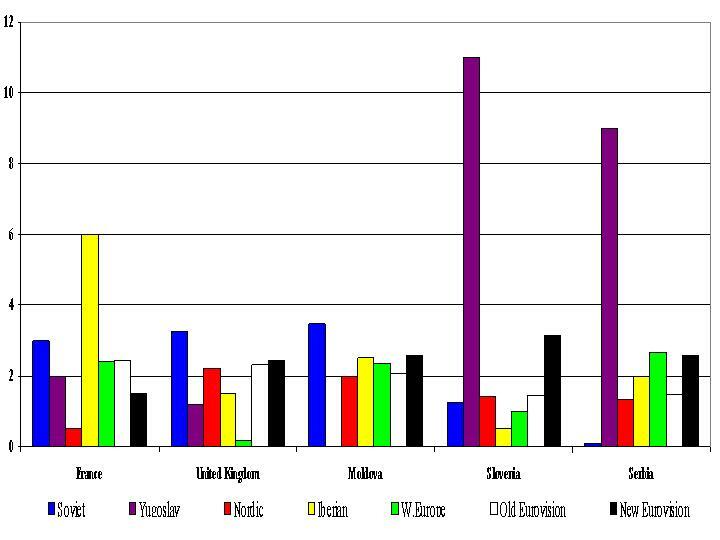 Not surprisingly, Azerbaijan won a significant amount of votes from other countries in the Former Soviet bloc (with its average vote brought down by the fact that it failed to win any votes from its neighbour, Armenia), but also managed to win a significant (though not as large) vote averages across all the other voting blocs. While there is something of a “catch-all” dimension to this voting pattern, Azerbaijan did attract a significantly higher number of votes however from the New Eurovision countries (average of 6.3 points against an average of 4.2 votes for the Old Eurovision c0untries). Somewhat mirroring the practice of PR-STV voting counts, it is also likely that Azerbaijan’s Eurovision prospects were helped by the elimination of Turkey and Armenia in the semi finals – with Azerbaijan probably winning higher points (“preferences”) in the final from a number of countries that may have gone to Armenia and/or Turkey had these countries been in the final. With the exception of a large vote from the admittedly very small Iberian bloc (suggesting this may be the bloc that second-placed Italy could well be located in) there is also a significant “catch-all” dimension to Italy’s vote pattern – although its average vote from the Former Yugoslav bloc is lower than that for the other blocs; could this indicate a reliance on jury votes? Vote patterns for neighbouring Sweden (3rd) and Denmark (5th), perhaps not surprisingly, proved to be quite similar, with both countries doing better amongst their own Nordic bloc and amongst the Old Eurovision countries, although Norway proved to be more reliant on vote from the Nordic bloc and Western Europe than Sweden did. By contrast, 4th plaved Ukraine draw more heavily on support from the New Eurovision countries and in particular from its own Former Soviet bloc (although Ukraine also won significant support from the Former Yugoslav bloc as well). 6th placed Bosnia won very few votes from the Former Soviet-Orthodox blox and indeed failed to win any votes at all from a Former Soviet state (putting to the lie the belief that “Eastern European countries all vote for each other”) but polled very strongly amongst the other countries in the Former Yugoslav bloc as well as attaining a sigificant number of diaspora votes from the Western European bloc (like Azerbaijan, helped in part by the fact that both Turkey and Armenia failed to make the final this year). Greece too attained a significant diaspora vote from Western Europe, while also doing well in terms of support from its own Former Soviet-Orthodox bloc. Georgia’s 9th placing was based on a huge level of support from the Former Soviet bloc (it was the most popular country within this bloc, even outpolling winners Azerbaijan). Germany’s 10th placing, by contrast, was largely dependant on a good vote amongst the Old Eurovision countries and in particular a good vote from other members of the West European voting bloc. Ireland’s votes were largely drawn from the Old Eurovision countries (from which it won an average vote of 4.8 points in the 2011 final, as against an average of just 1.1 points for the New Eurovision countries). 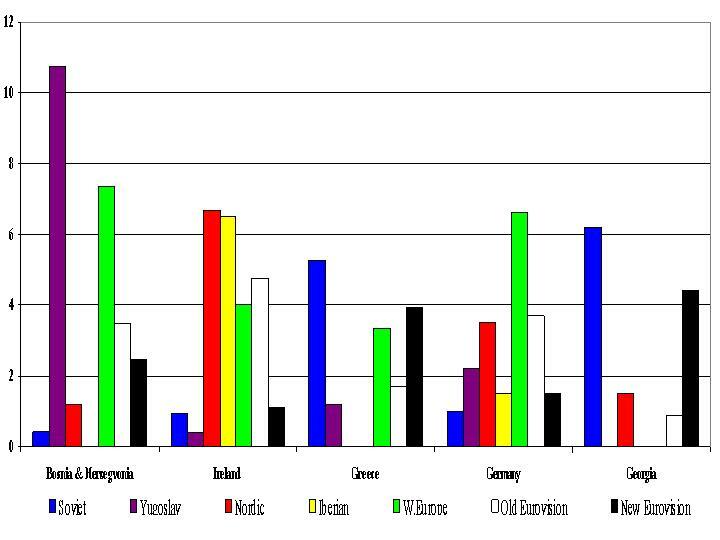 In this contest, the Nordic Bloc again emerged as our main source of points (with an average of 6.7 points being won other countries in this bloc including douze points from Denmark and the United Kingdom), although high support levels were also earned from the other (mainly) Old Eurovision blocs; the Iberian bloc (6.5) and West European bloc (4.0). However, Ireland won few votes from the Former Soviet bloc (0.9 points on average, with most of these coming from Slovakia) and even fewer from the Former Yugoslav bloc (0.4). The voting pattern for the United Kingdom (11th) and France (15th) in this contest was rather unusual in that these were amongst the few countries to win more votes from another bloc (in this case the Former Soviet-Orthodox bloc) than their own and the UK was also one of the few Western European countries to attain (slightly) greater support levels from the New Eurovision countries. The two former Yugoslav states, Slovenia (13th) and Serbia (14th), both relied heavily on the Former Yugoslav bloc for support, although this contest was notable in that it was the first contest during the televoting era in which Slovenia proved to be the most popular country amongst the Former Yugoslav bloc (while Bosnia ranked higher overall, Slovenia won a higher average vote from the Former Yugoslav bloc countries than either Bosnia or Serbia). 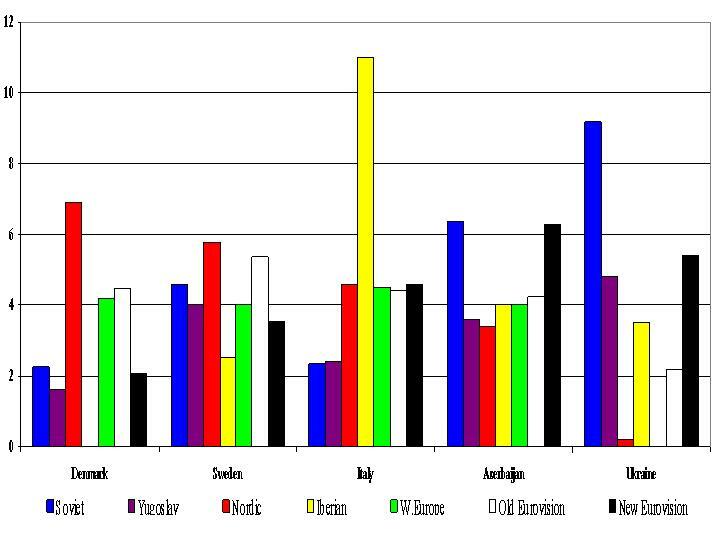 While Moldova (12th) did attain somewhat higher support from its own Former Soviet bloc and the new Eurovision countries, its support pattern does have a certain “catch-all dimension” to it with its average support levels across all blocs being remarkably similar (it support within the Nordic bloc being significantly assisted by the award of 10 points from Ireland). Russia again got its highest votes from the Former Soviet bloc countries, although its ranking amongst this bloc has declined in recent contests – while it was the most popular country amongst this bloc in the mid-2000s (culminating in the 2008 contest, which it won) its average vote has dropped by 4 points in the last three contests and other countries such as Georgia, Azerbaijan and The Ukraine are now winning more votes within this bloc. Lithuania also got a significant number of its votes from the Former Soviet bloc, but the average vote it received off the Nordic bloc, of which it is a part, was higher than this. Both Lithuania and Russia won higher average votes from the New Eurovision countries, but Romania tended to do better in terms of winning votes from the Old Eurovision countries with its highest average vote levels (as in previous contests) being won from the Iberian bloc countries. Austria polled best within its own West European bloc although a significant chunk of its votes also came from the Former Yugoslav bloc. Iceland won a significantly higher vote from the Old Eurovision countries, with its highest average votes being won from the Nordic and Iberian blocs. Both Finland and Estonia relied heavily on support from their own nordic bloc and failed to make much headway in terms of winning support from the other blocs. Spain received a maximum vote from the Iberian bloc but this is explained by the fact that – with Andorra not taking part this year – that there was only one other country from this bloc competing in the 2011 event. The other two countries taking up the bottom five placings did not win their highest vote shares from within their own blocs; Hungary won its highest average vote levels from the Iberian bloc while luckless Switzerland failed to win any votes from within its own Western European voting bloc. The most popular country amongst the Former Yugoslav voting bloc this year was Slovenia, followed by Bosnia and Serbia. This marked a significant change within this bloc, given that Bosnia and Serbia (as well as Croatia) have tended to dominate the votes from this bloc over past contests. Romania, Moldova, Georgia, Finland and Estonia all failed to win any points from a country within the Former Yugoslav bloc – interestingly four of the five countries listed here are East European countries, disproving the thesis that “East European countries all vote for each other”! Sweden (4.0 points average) was the most popular West European country within this voting bloc. Denmark narrowly edged out Ireland (by 0.2 points) as the most popular country within the Nordic Bloc in this contest, reflectign the trend from last year in which Denmark was the second most popular country within the Nordic bloc, just behind the contest winners, Germany. Ireland’s average points tally from the Nordic bloc countries improved significantly relative to 2010 at this contest – Ireland won an average of just 1.1 points from this bloc in the 2010 Final but this increased to 6.7 points for this year’s final. Other popular countries within this bloc for this year’s final included Sweden, Finland, Italy and Germany (in that order) with Azerbaijan being the most popular of the Eastern countries for the bloc members. Greece was the only country to fail to win any points from this bloc. With just two countries from the Iberian bloc taking part this year (with Andorra not taking part), vote trends proved to be more cut and dried here. Portugal (who was not in the final) awarded Spain 12 points. Italy was the most popular of the countries outside this bloc with an average of 11.0 points, followed by Ireland and France, with Romania and Azerbaijan following these as the joint fourth most popular countries for the Iberian bloc countries. Normally Turkey and Armenia earn significant points from the Western Europea-Diaspora bloc but both these countries lost out in the first semi final, meaning that there were more points on offer from this bloc than usual for the other Eurovision countries. Bosnia-Herzegovina proved the most adept at picking up these diaspora votes and emerged as the most popular country within this bloc, winning an average of 7.3 points from the bloc members, putting Bosnia ahead of Germany (6.6), Italy (4.5), Denmark (4.2) and a group including Ireland, Azerbaijan, Austria and Sweden (4.0). Four countries failed to win points from this bloc – one of which actually was a bloc member (Switzerland) with the others being The Ukraine, Georgia and Lithuania. The Ukraine was the most popular country for the Former Soviet-Orthodox bloc members in this year’s contest, with an average of 9.4 points from the different bloc members, followed by Azerbaijan (6.4), Georgia (6.2) and Greece (5.3), with fifth-ranked, Sweden (4.6), emerging as the most “popular” of the Western finalists. Russia, which had dominated this bloc in the mid-2000s culminating in a 9.5 vote average from bloc members in the 2008 Belgrade final, was only ranked 6th (with a 4.5 point average) in this year’s final and has seen its average vote from other bloc members fall by 4-5 points over the past three contests. The most “popular” country for the Old Eurovision countries in this year’s contest was Sweden (with an average of 5.4 points), followed by Ireland (4.8 point average), Denmark (4.5), Italy (4.4), Azerbaijan (4.2) and Germany (3.7). Switzerland (with an average of just 0.5 points) earned the least amount of points from the Old Eurovision countries, with Russia (0.8), Georgia (0.9) and Lithuania (1.0) also receiving little in the way of points from these countries. The most “popular” country for the New Eurovision countries in this year’s contest was Azerbaijan (with an average of 6.3 points), with The Ukraine (5.4) being the second highest ranked country. Interestingly, given that many of the New Eurovision countries were only having their first opportunity to vote for them, Italy (4.6) emerges as the third most popular country for the New Eurovision countries. The next highest ranked countries were Georgia (4.4), Greece (3.9), Swden (3.5) and Slovenia (3.1). Switzerland (with an average of just 0.4 points) earned the least amount of points from the New Eurovision countries, with Finland (0.6), Iceland (0.6), Estonia (0.9), Spain (1.0) and Hungary (1.0) also receiving little in the way of points from these countries. This entry was posted on May 16, 2011 at 12:26 pm and is filed under Eurovision, Voting analysis. You can follow any responses to this entry through the RSS 2.0 feed. You can leave a response, or trackback from your own site.